What to Do if You Get Rain in a Lawn Mower Engine? Summer storms come up so suddenly it's common to leave a lawn mower out in the rain. A mower that's been rained on it may start right up. If not, there are a number of troubleshooting steps you can take before you call a professional for repair or replacement. Lawn mower engines are designed to tolerate an occasional sprinkle so a little bit of rain on a lawn mower's engine shouldn't hurt it. When the rain passes, start your mower and let it run for a few minutes. The heat from the engine will drive out any moisture and keep the motor from rusting. Dry off the lawn mower's deck and handle and store it out of the elements. If the mower won't start after a heavier storm, it may require some home maintenance, though the engine itself probably isn't damaged. 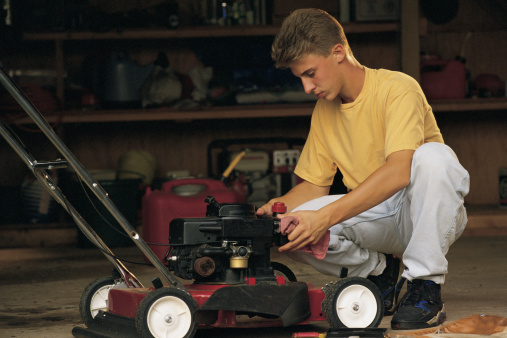 Water in the fuel is the most likely reason a lawn mower won't start after it's exposed to rain. Disconnect the fuel line where it connects to the carburetor and drain the fuel into a pan. Allow the fuel tank and line to air dry. Carbureted engines will have a small sediment bowl between the gas tank and the engine, which captures water. Loosen the nut on the bottom of the bowl to drain it. Replace the fuel filter if your mower is equipped with one. 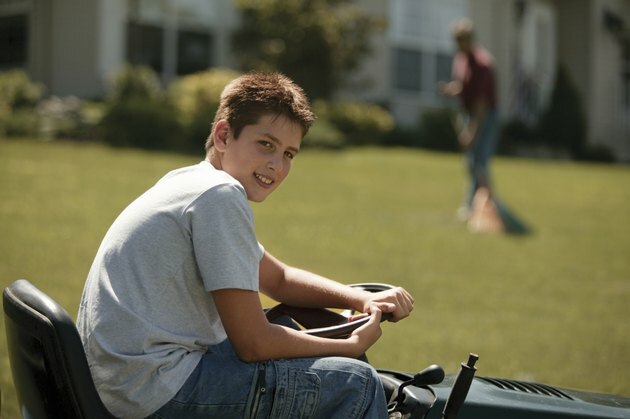 If the mower's oil appears milky, it's contaminated with water and should be replaced. Drain the crankcase through the drain plug, if equipped. Tilt your mower and drain the oil through the filling tube if it doesn't have a drain plug. Remove the spark plug to drain any water from the cylinder. Add a teaspoon of motor oil through the spark plug hole and rotate the blade several revolutions to spread the oil. If you aren't able to turn the motor by hand it may be rusted: call a small-engine mechanic for repair. Inspect the spark plug for rust or fouling and replace it if necessary. Check the spark plug boot for moisture as well and add an electrically conductive silicone lubricant or a water-displacing spray to the boot to avoid electrical faults. A wet air filter can prevent air from flowing smoothly into the engine. Replace the air filter and while the engine is exposed spray a little carburetor cleaner directly into the air intake. Refill the engine with oil and fresh gasoline. An ounce of 99 percent pure isopropyl alcohol (sold as gas line antifreeze) per gallon of gas will help absorb any moisture left in the fuel system. Start your engine and allow it to idle for a few minutes to dry any remaining spots of moisture. Based in Colorado, Erik Johnson has been writing professionally since 1996 and has worked in real estate, management and technical fields. Recipient of the 3M Richard G. Drew Recognition of Creativity, Johnson is the author of three books.